Some of our best people are DofE Award holders. Read one of their stories below. What do you do on an average working day? I work in the marketing team at Specsavers on the Hearcare business. Our team is responsible for planning and implementing the national marketing strategy to raise awareness of the brand and drive footfall into stores. I work closely with lots of other departments, including retail, PR, our in-house creative team and an external media agency to deliver the plans which can include anything from national TV campaigns to creating new apps. I love that my role is really varied and no day is the same. What are your top tips for getting into your career? Get as much experience as you can when you’re working out what it is you want to do. I had no idea that marketing would be a field I’d be interested in until I took a four week temp job at Specsavers. So few people have decided on a vocation when they finish school or university, so the best way to get an idea of what a job will be like is to give it a go. Not only do you get to see if it’s something you enjoy, but a company gets to know you too, and if you do a good job they’ll remember you if you decide to interview in the future. Plus, you’ll have the experience to put on your CV and to talk about with future employers. Whatever you do, pursue something that you can be passionate about. Whether that’s in your career or in life. If you enjoy what you do you’re much more likely to do a good job and to get better at it. Plus you’re going to spend a lot of your time working, so it makes sense to do something you’re interested in! Outside of work my passion is travel and to write, so I make time to explore the world and to keep writing. I spent 5 years working in London and found that I quickly lost my work/life balance. Since leaving the city I’ve learnt to spend more time doing the things I love. The DofE is a great way to learn new skills and test your limits. It gives you a good reason to try out something new that you’ve always wanted to give a go. The expedition element in particular really helps you to learn team working skills (when you’re freezing, hungry, exhausted, lost in the Welsh wilderness and it’s getting dark, you quickly learn a lot about group dynamics and your own personality!) Pushing yourself to do things you’ve never done before makes you realise you can achieve whatever you set your mind to. 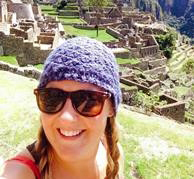 I recently trekked the Inca Trail to Machu Picchu and the mental strength I’d learned on DofE definitely helped me get to the end. Plus, I’m really quick at putting up a tent at festivals! What is your favourite DofE memory? contributed to my love of adventure and the outdoors!